Is it snowing in Samnaun ?ありがとうございました! Mild with moderate rain (合計 12.0mm) 金曜日の午後に, Becoming colder with a light covering of snow, mostly falling 金曜日の夜に. Freeze-thaw conditions (最大 13°C 木曜日の午後に, 最小 -2°C 金曜日の夜に). Wind will be generally light. Moderate rain (合計 14.0mm), heaviest 土曜日の夜に giving way to a moderate fall of snow, heaviest 土曜日の夜に. Freeze-thaw conditions (最大 5°C 土曜日の午後に, 最小 -1°C 土曜日の夜に). Wind will be generally light. Pretty quiet, charming village set in a narrow valley with minimal traffic, at least if you stay up in Dorf. Tax-free prices make shopping for skis, sunglasses, cigarettes and booze attractive to many. Seems to bring in a predominantly German and of course Swiss crowd. Very little by the way of English speakers and perhaps surprisingly not very many Dutch who seem to prefer Ischgl as a base. Stayed at the Hotel des Alpes - nice rooms, spectacularly presented food and great breakfast buffet. Access to 'double-decker' cable-car is by skating along a path or via regular ski-bus which skirts the village. Most of the skiing is found between about 2000m and 2800m which makes for pretty good snow reliability. Beginners would probably not care for the resort runs back to either Ischgl or Samnaun although the Laret run to Samnaun is more accessible than the others. Up at the top, though, there is a fair amount of easy skiing to be found above the Idalp and at H?llenkar on the Austrian side and down from the Idjoch to the Alp Trida on the Swiss side. The ski area is really ideally suited to the intermediate skier with plenty of cruising to be had with very little time spent on lifts and in queues. The interesting shape of the terrain also helps to keep things interesting. If you're looking for a bit more of a challenge, there is enough to keep most people happy for a week, although possibly not two. Runs marked black on the piste map are steep, at least in sections, but are groomed and do therefore not develop into mogul fields. There are a number of areas that do get moguled pretty quickly though. 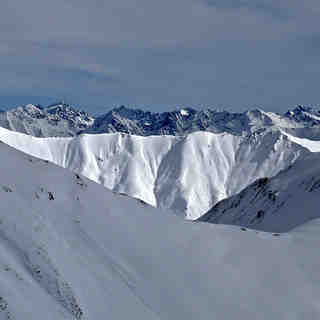 The ski route under the Greitspitz chair is one that is fairly narrow and steep and tends to have good snow conditions. You'll find more bumps at the top of the H?llenspitzbahn on the right hand side as well as further down between the two black pistes. Another place to go is the ski route which leads off the enjoyable black from the Pardatschgrat down to the Velilleckbahn. There's also some great powder to be found in this area if you head right down into the Velilltal just a little before you get to the marked route. The slope has a very steep pitch near the top and does not seem to get skied out very quickly at all. Further up the Velilltal, the route down from the Viderjoch starts with a traverse across from the top of the lift before leading you steeply down into the valley. This was powder when I visited but presumably develops some pretty big moguls after a few days without fresh snow. The extremely narrow and steep gully on the left hand side of the Gratbahn is also good for a challenge. On the Swiss side, you'll find powder over by Alp Bella, particularly by the Mullerbahn. Elsewhere, the black from the top of the Palinkopf towards the Paznauner Thaya gives you a good 800m of vertical and is nice and steep virtually all the way, but if you drop off the edge of the path right at the top (exercise caution - avalanche danger), there is fantastic powder down towards the Gampenbahn. If you're based in Samnaun, you can finish the day by skiing down the other side of the Palinkopf but again dropping off the side of the marked path at the top for a steep face of powder. This ski area definitely does have its challenges, especially if you go looking for them. Some people even manage to ski from the Alp Trida Sattel down to Samnaun under the cable car, but you'll really want to have someone who knows their way about before you tackle that or there's a substantial risk that you'll end up at the bottom of a cliff. Decent places can be found in both Switzerland and Austria, but while I prefer Switzerland as a base Austria offers the better value for money when it comes to food. Fill yourself up on cheese 'sp?tzle' down at the Paznauner Thaya or grab a tasty pizza or bowl of pasta from the Schwarzwand in the H?lenkar for only 7-8 euros. The area does have its fair share of self-service restaurants on the slopes, but it has to be said, they're for the most part nicely decorated buildings with plenty of atmosphere and good facilities too if you're picky about that kind of thing. Service was friendly all over, with the place at the top of the Pardatschgratbahn deserving special mention, not for its rather bland interior, but for the guys behind the counter in the self-service restaurant and their 'obligatory mouthwash' induced joviality. Given the time of year (Christmas), I wasn't expecting much by way of queues and was not disappointed. The lift system is probably the most modern I've seen anywhere. Three gondolas provide mountain access from Ischgl with the cable-car providing the access from Samnaun. Once you're up there, all but a couple of lifts are high speed chairs with a number of six packs and even two eight-man chairs. There has been huge investment here and it's hard to imagine queue problems even at peak times. There is no longer any skiing in the resort that can only be reached by drag and with further lifts being planned for the coming season(s), this resort is certainly one to watch for the future. Different resorts are good for different people, but I found the shape of the mountain more interesting than at the much more famous St Anton where a frustrating lift system, crowded slopes and snow reliability issues at lower altitude all restrict my enjoyment. These are not problems common to Samnaun which I feel is certainly a resort worth considering if you're wondering where to go for a week and fancy trying somewhere new.